Soaring over the Comox Valley and Strathcona Park with 49 North Helicopters. An adventurous weekend getaway is never a bad idea. With the natural beauty and burgeoning craft beer scene in the Comox Valley beckoning, I just knew I had to make the trip! Having never been to this part of Vancouver Island before, I was eager to do some research on the area and discover what it has to offer, and the more I learned, the more excited I became. The Comox Valley is on the eastern coast of Vancouver Island and includes the cities of Comox, Courtenay and Cumberland. 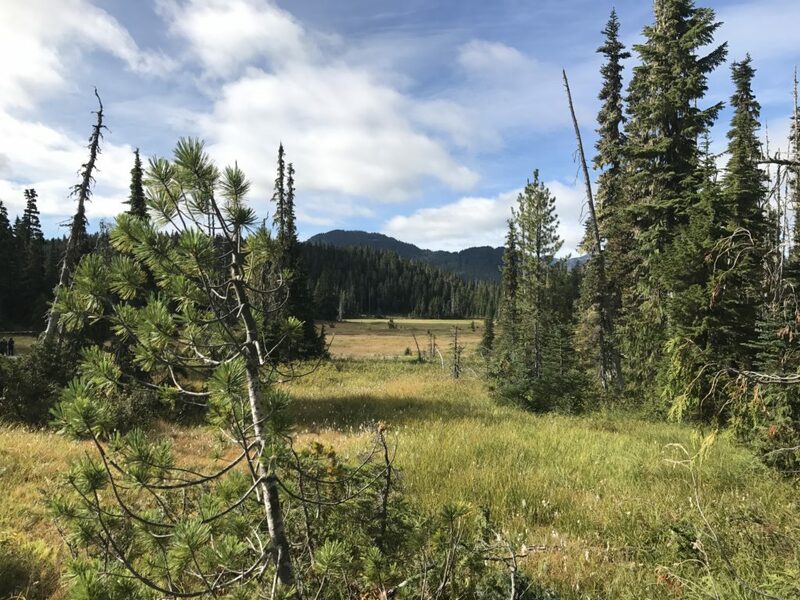 It is also in very close proximity to Strathcona Provincial Park, a 2458 sq. 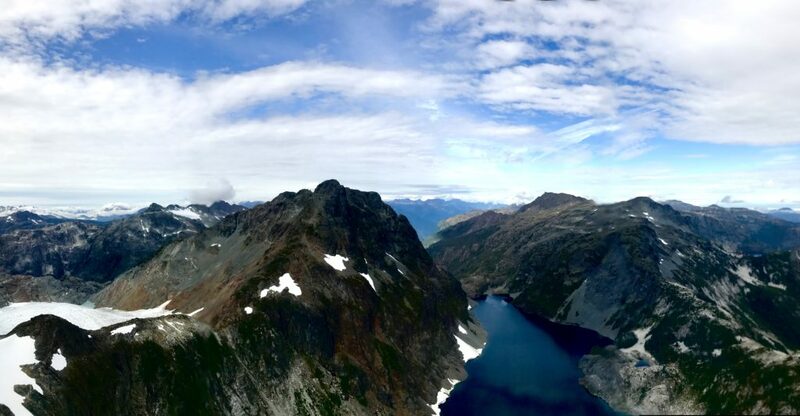 km park known for its amazing hiking trails, lakes, waterfalls and glaciers, not to mention pristine forests and colourful alpine meadows. 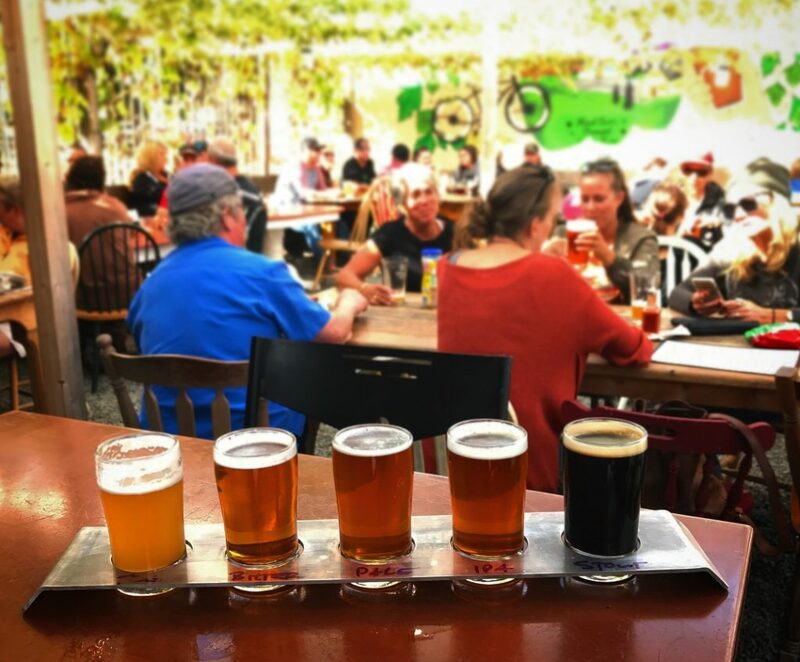 The region is also home to some great craft breweries, Gladstone Brewing, Forbidden Brewing and Cumberland Brewing, which can be found on the Nanaimo and Comox Valley Ale Trail. 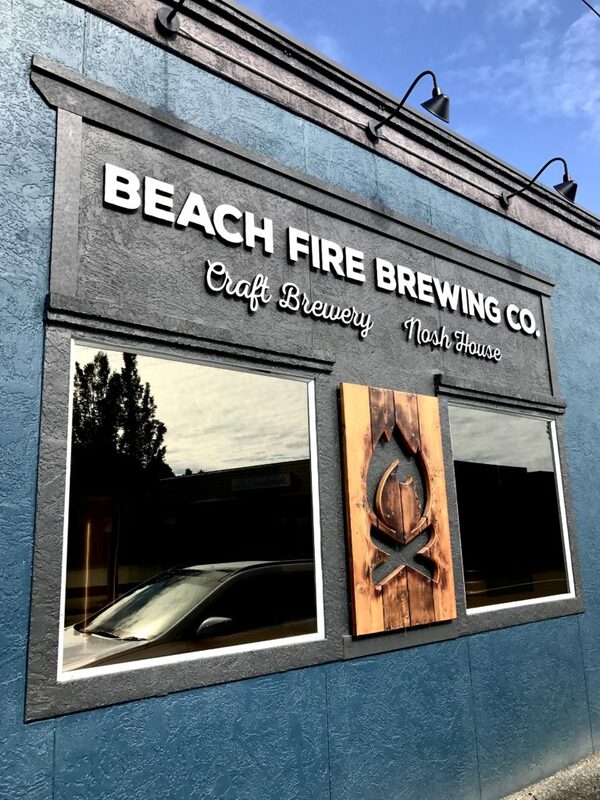 A little ways up the Island Highway in Campbell River you can also find Beach Fire Brewing and Nosh House making the region a perfect place to explore the beautiful wonders of the great outdoors as well as some tasty BC trail beers! Our flight out of Vancouver with Harbour Air was scheduled for an early morning departure so we arrived at the marina as the sun was about to rise above the horizon making for a gorgeous start to the day. The near cloudless sky made for quite a sunrise! 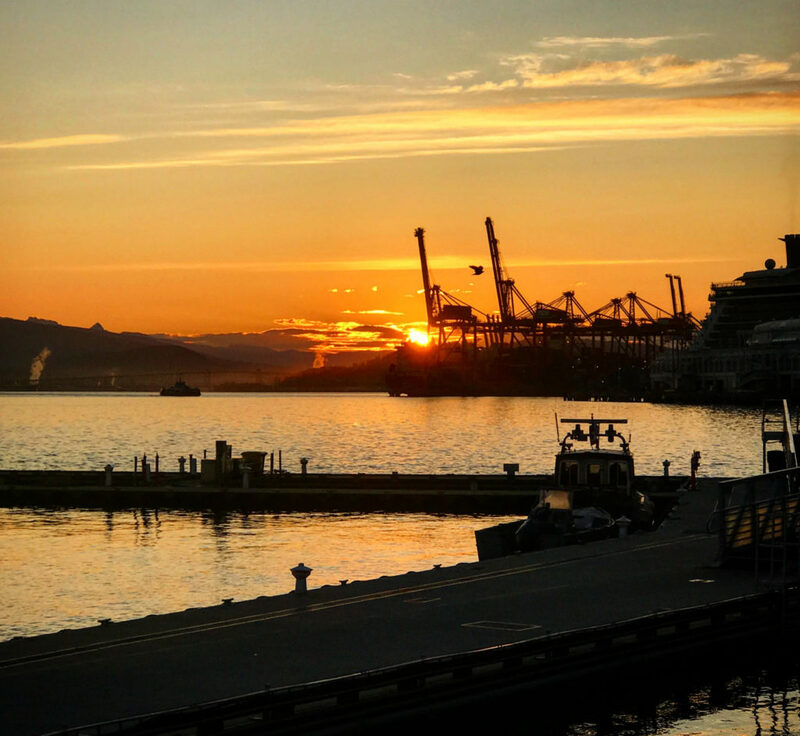 Sunrise at the Harbour Air Seaport in Coal Harbour, Vancouver. Check-in was a breeze and before we knew it we were already making our way down the ramp to the dock where we would soon board our DHC-3 Turbine Single Otter Seaplane, a rather cozy plane that only seats a maximum of 14 people. This was my first ride aboard a seaplane so I was excited and a bit nervous to be honest, but that went away quickly as the plane gently lifted off the water and climbed towards the east over the Lions Gate Bridge. 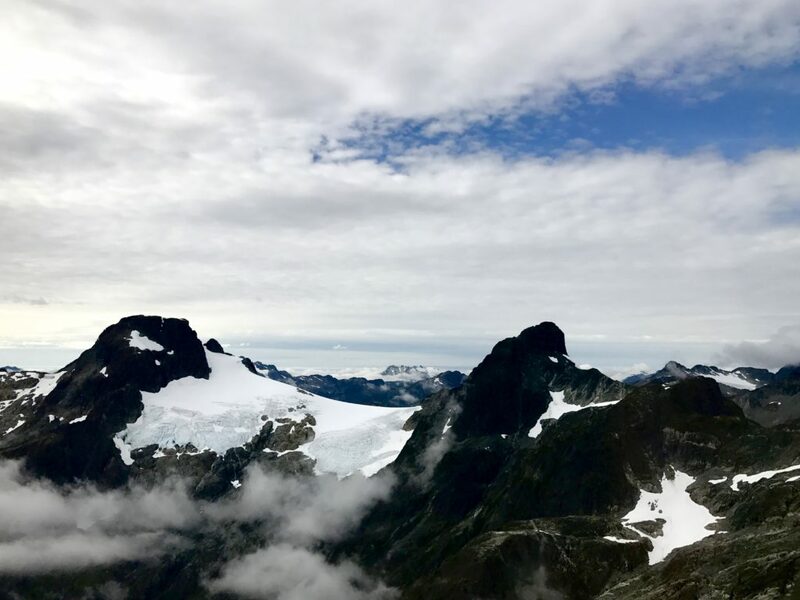 The views along the way were spectacular as the plane’s cruising altitude is below 3000 metres. 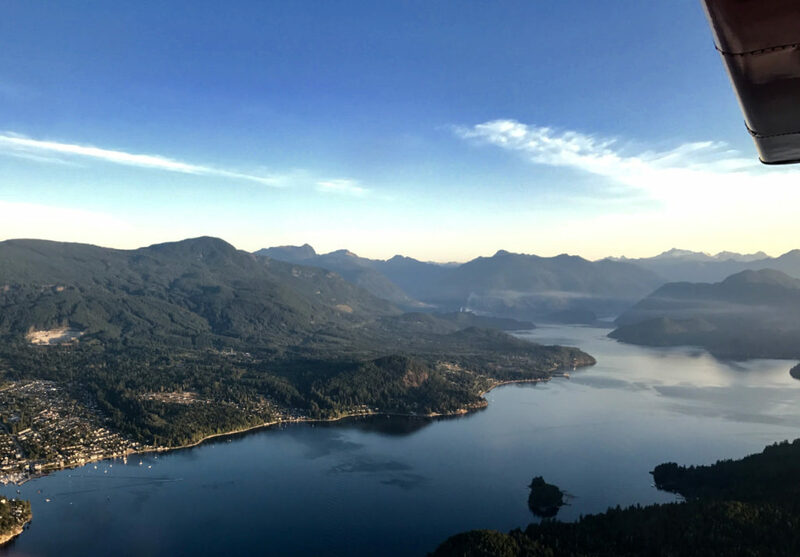 With the Vancouver skyline disappearing into the distance, we did our best to figure out what islands and cities we were seeing below us while marvelling in the breath-taking views of the Howe Sound, coastal mountains and Sunshine Coast. Fifty minutes later we were touching down at the Comox Valley Marina. Flying over the Sunshine Coast and Howe Sound en route to Comox. We had yet to have a proper breakfast and found a cool local breakfast joint called The Hen and the Hog Cafe. It’s a tiny little place with limited seating, but trust me when I say it’s worth the wait. I had their daily feature which was two poached eggs in a chipotle marinara served with smoked bacon, toast and hash browns, while my wife enjoyed a much healthier option of quinoa, yogurt and fresh fruit. Both of us thoroughly enjoyed our meals and we left with our solid base for a day that about to be spent touring some wineries and breweries. We dropped our bags off at our accommodation, the beautiful Crown Isle Resort, and awaited our tour guide to pick us up for our tour. We booked a day tour through Discover Comox Valley and were excited to get started! Our guide Brent informed us that we were the only ones on the tour that day so we basically had our own private driver who encouraged us to just go at our own pace and take it all in. Our first stop was 40 Knots Winery. 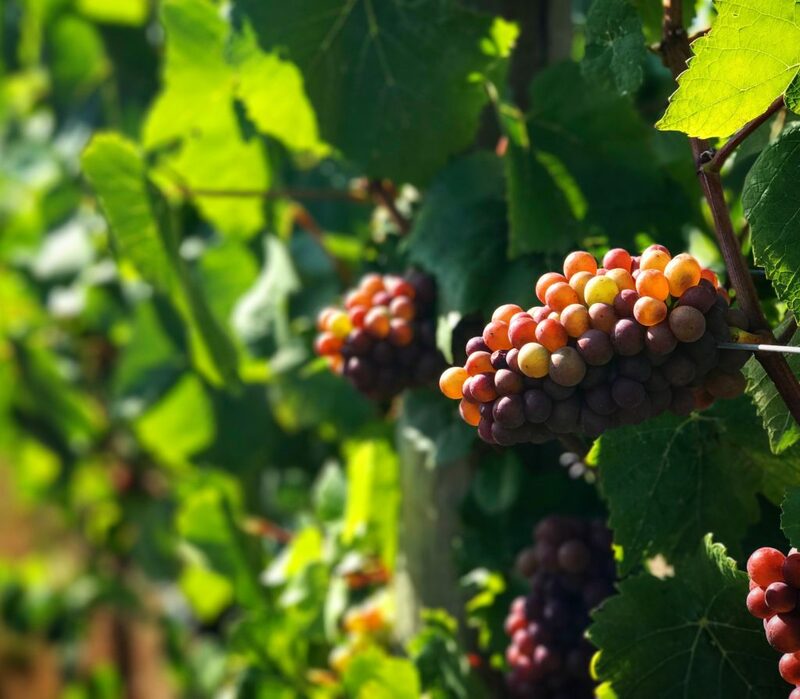 As we rolled in the first things we noticed were the lush rows upon rows of grapes and a beautiful, rustic barn-shaped building with the double doors swung wide open, inviting us into the tasting room. The tasting room at 40 Knots Winery. Charlene greeted us and we got down to wine sampling right away, running through four different wines: White Seas, Uncloaked Chardonnay, Rose and the recently released Stall Speed Meritage. All of them were quite tasty and we settled on a bottle of the Chardonnay to bring home. We took a little stroll from there down into the vineyard and snapped a couple of photos before loading back into the minivan for our trip to the next stop. From there we headed to Coastal Black Winery, which lies just on the outskirts of the Comox Valley. It is a fruit winery that also specializes in mead and honey. This was a unique experience for us as this winery does not use any grapes! We settled into the tasting room where we were greeted by Sam, one of the winemakers, who offered us up some samples of their blueberry table wine, Blueberry Mead, Sparkling Raspberry Brut and a Blackberry Sparkling Brut. These styles and flavours were all new to us and both of us really enjoyed them. So much so that we got a bottle of each! We then went on a quick tour in the back and got a little inside scoop that they are currently doing some test runs on making their own ciders. I’m sure they will be amazing as well. 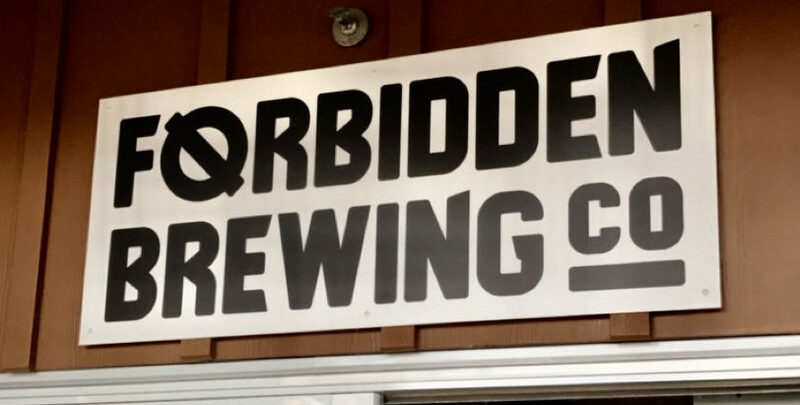 It was time to finally get into the local craft beer scene at Forbidden Brewing. Back to the tour van and off to Forbidden Brewing in downtown Courtenay. We found a seat and I ordered the flight on offer. Being a nano-brewery they only had four options, but all of them were quite enjoyable, especially the Arnold Schwarzen’ale. 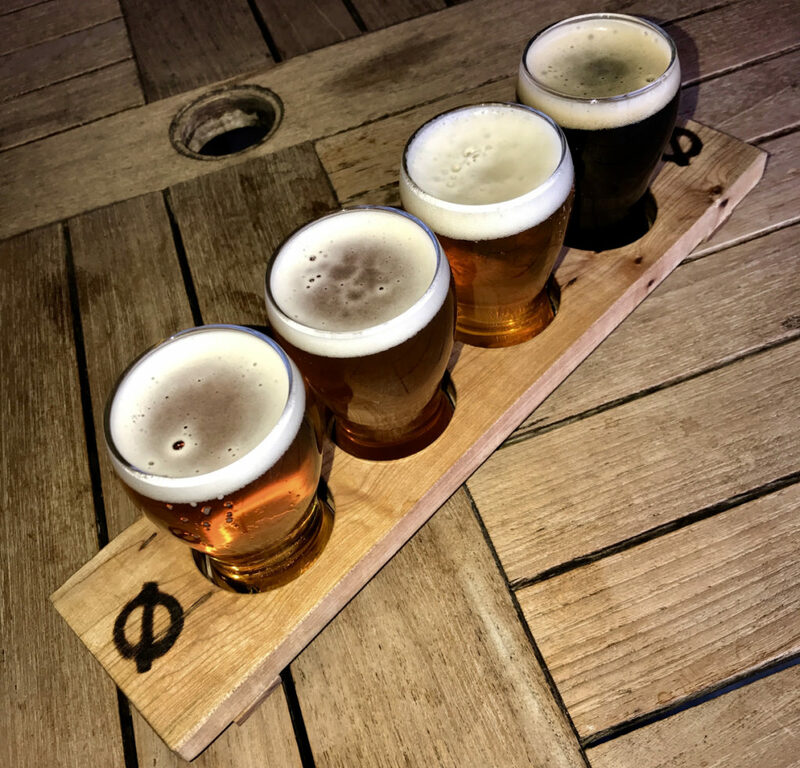 A flight at Forbidden of the following; Witbier, Forbidden IPA, Arnold Swartzen’ale and Golden Ale. The vibe was chill and comfortable and the opportunity to chat with the staff was a lot of fun. We were getting hungry and we heard our final destination had some great tacos so we moved on. We arrived quickly at Gladstone Brewing, which had a vibrant atmosphere, great music and a very unique overall design that was still themed around the building’s history as a car mechanic’s shop. 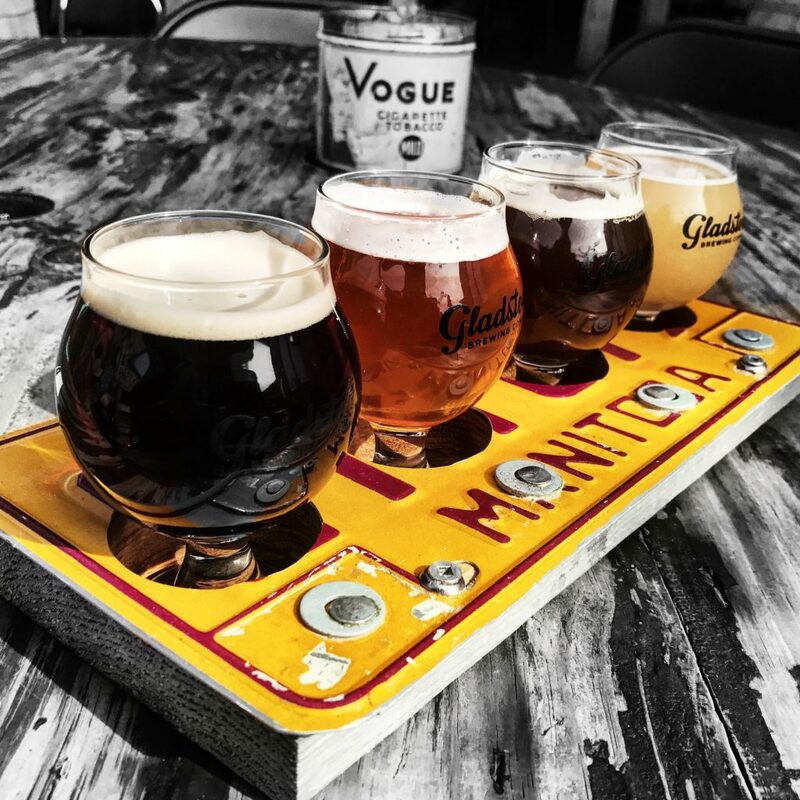 Love the classic Canadian licence plate flight trays at Gladstone Brewing. With a selection of eight beers to choose from, I narrowed it down to some unique styles, a Belgian Stirling Single, Munich-style Festbier, Gose and a Burton Ale, which was a collaboration with Vancouver Island Brewing. We grabbed a seat outside on the patio and soaked in some sunshine. By this time we decided we should probably get something to eat and ordered a sampling of the tacos from Taqueria Guerrilla located in the brewery. The chorizo and the pork belly tacos were my favourites, while my wife enjoyed the cauliflower and kimchi one. I also grabbed a couple 4-packs to go and a pint of the Burton Ale, as it was my favourite on the flight. We enjoyed the heck out of our little feast while chatting with some locals about their favourite hiking spots and hidden gem restaurants. 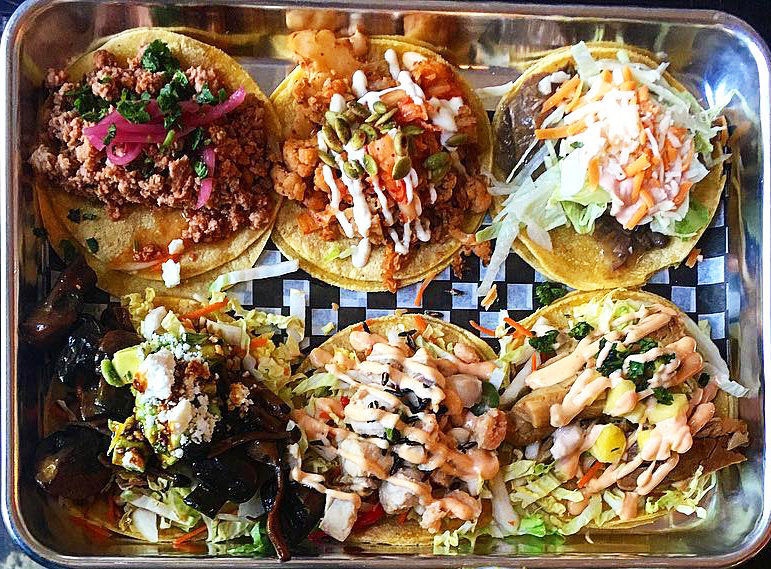 The addition of Taqueria Guerrilla to Gladstone means there is always a possibility of a taco feast while sample some beers! I highly recommend ordering up one of each! That brought our tour to an end, so we hopped into the minivan and our driver delivered us back to the hotel for an afternoon siesta. The early morning flight and afternoon sampling session had taken its toll and besides…we were on holidays! The room itself at Crown Isle Resort was a stunner! It had a full kitchen, living area, huge walk out deck that faced the first tee of the golf course, fireplace and a big 50 inch TV. The bedroom had a jacuzzi tub big enough for two, another TV and a fireplace. We crashed on to the comfy king size bed and had a power nap. Later that night we made our way into town for a nice dinner at Locals Restaurant. They had a three-course meal deal that had options that appealed to both my wife and me so we went ahead and ordered those. She had the seafood chowder, a grilled halibut and prawn entrée, and a dessert sampler, while I enjoyed a crab cake starter, chanterelle mushroom risotto with poached pear as my main, and a berry pie with custard filling. Everything was presented exceptionally well and tasted amazing. With our bellies full, we headed on home for a good night sleep. Alpine meadows near the trail head of the hike to Lake Helen McKenzie in Strathcona Park. We decided that a day of hiking and exploring would suit us just fine so we set out in search of some nourishment and found another great local restaurant recommended on the BC Ale Trail. This place was called Atlas Cafe. The food there was also creative and delicious, and the coffee was tasty. 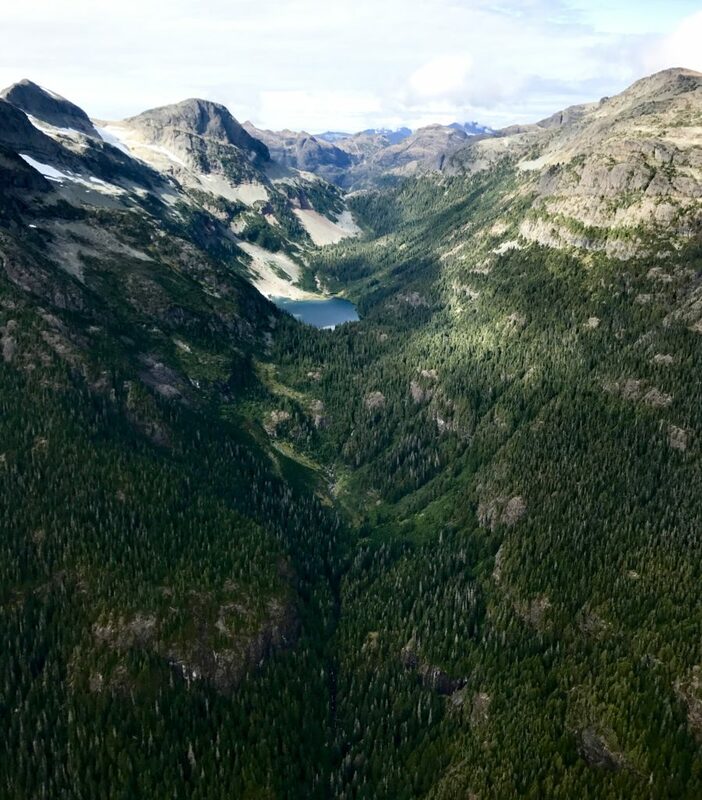 From there, we headed out on a hike in Strathcona Provincial Park called Lake Helen Mackenzie, an 8.5-km hike with a modest 450m of elevation gain. We drove the 30 km up Forbidden Plateau towards the Mount Washington Ski resort where we found the trailhead for our hike. I always pack one trail beer to be enjoyed when I reach the hikes destination. 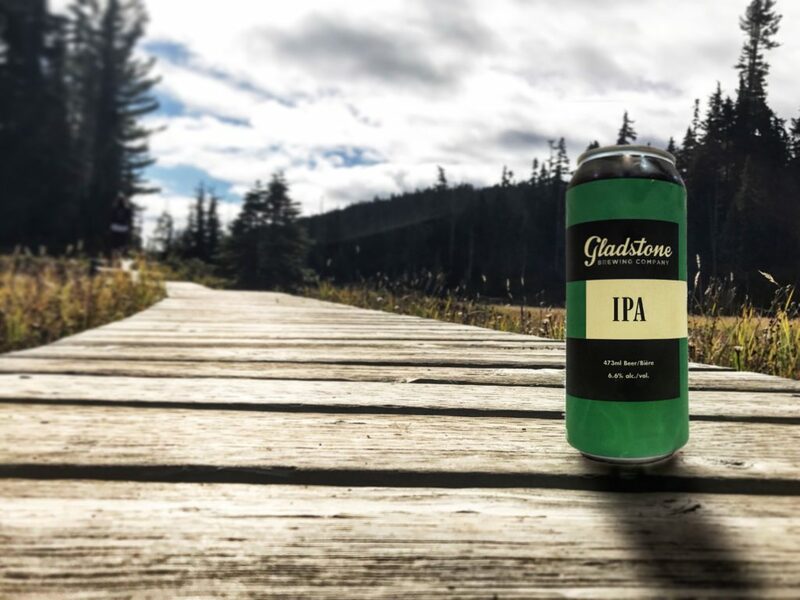 This Gladstone IPA definitely hit the spot when we reached the Lake. The trail begins with a beautiful walk through an alpine meadow along a wooden boardwalk that stands just above the ground. With it being the end of September there was no snow on the ground and the leaves were starting to show signs that autumn was setting in. After a kilometre or two, the trail heads uphill, and soon it emerges alongside Battleship Lake. The views from here are so pretty. Looking out across the still water towards Mount Washington, you can see the ski runs that carve up to the peak, all of it reflecting on the water like a mirror. Further along the trail we were entertained by a few squirrels and some extremely confident grey jays that happily ate from the palm of your hand if offered food. One more quick hike before we hit up Cumberland Brewing for a visit. 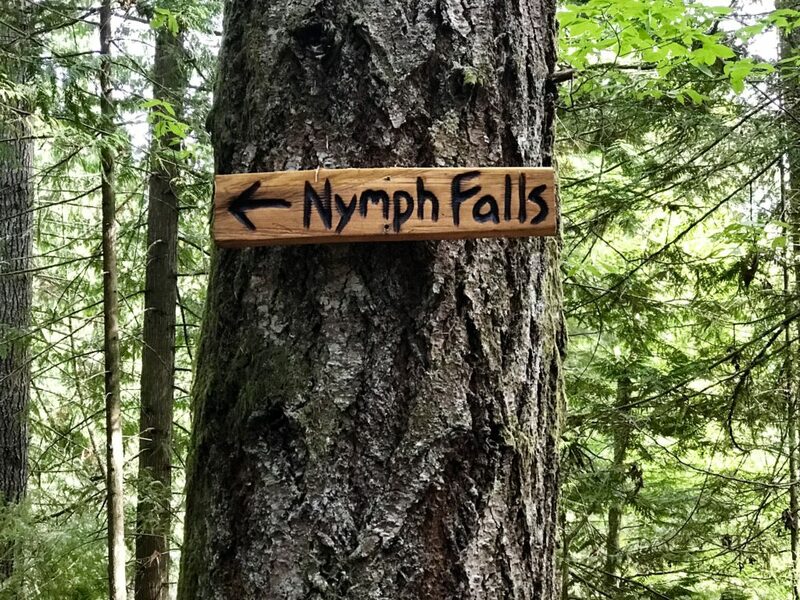 As we were leaving, it was decided that we would make one more quick stop to see Nymph Falls before continuing our way along to Cumberland Brewing Co. The trail in is very short and well-groomed so it only took a few minutes to get to the river’s edge and see the active area of rapids knows as Nymph Falls. We snapped a couple of pictures and made our way back. Having now walked over 11 kms, we were ready for some beer sampling and food. 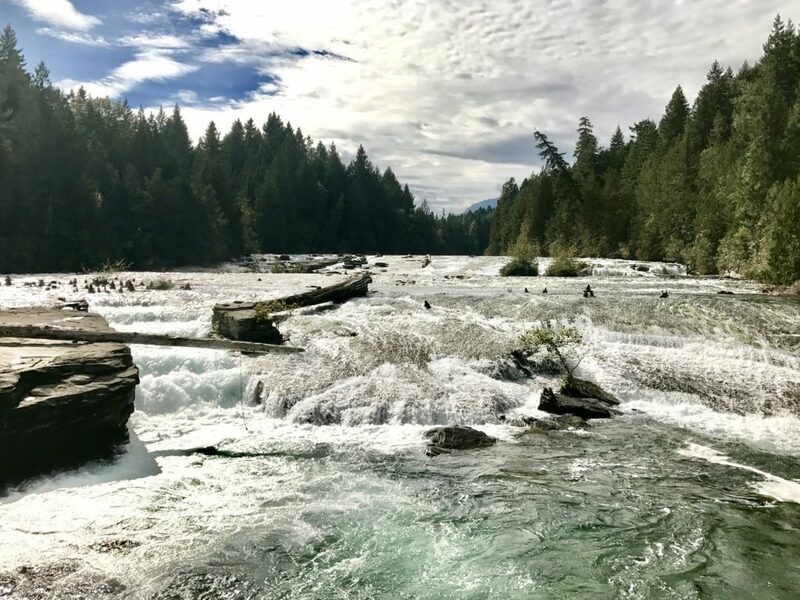 The spectacular Nymph Falls cascade over fish ladders blasted out 70 years ago to help spawning salmon swim upstream. 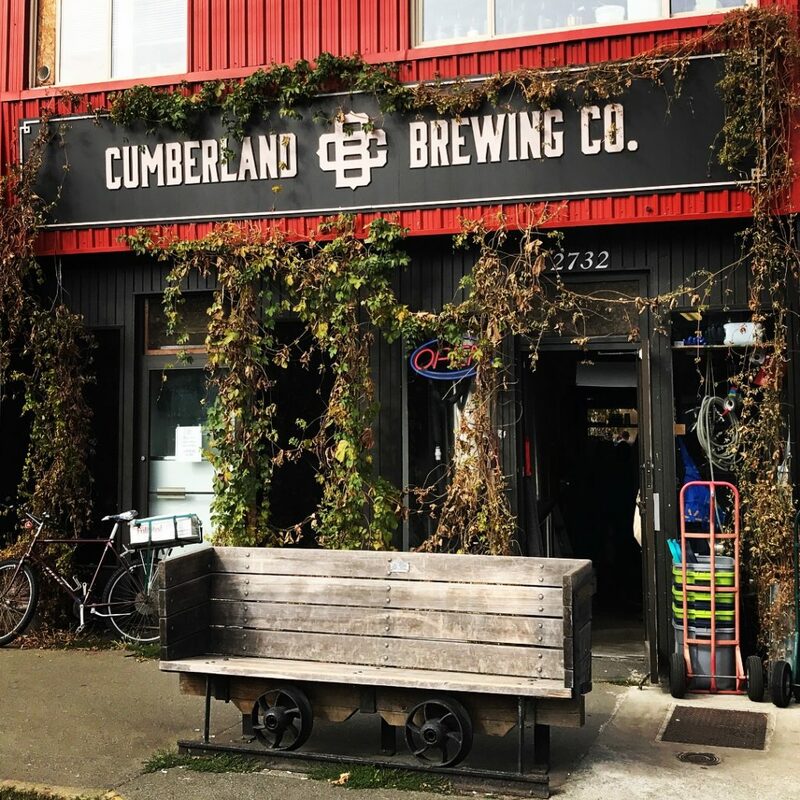 We arrived at Cumberland Brewing and immediately scoped out a spot to sit on the packed outdoor patio. It was late afternoon and this place was hopping! With one eye scanning for patio vacancies and the other reading over the menu board, we were greeted by the energetic staff and offered a flight of five beers. Of course, I accepted while my wife opted for a cider. Cumberland Brewing was our next stop. Food and beer always tastes better after getting out and earning it on the trail! The moment I was handed my flight I saw a couple leaving so we made a B-line for the table. After starting off my flight we began perusing the food menu, and man did that get my mouth watering. 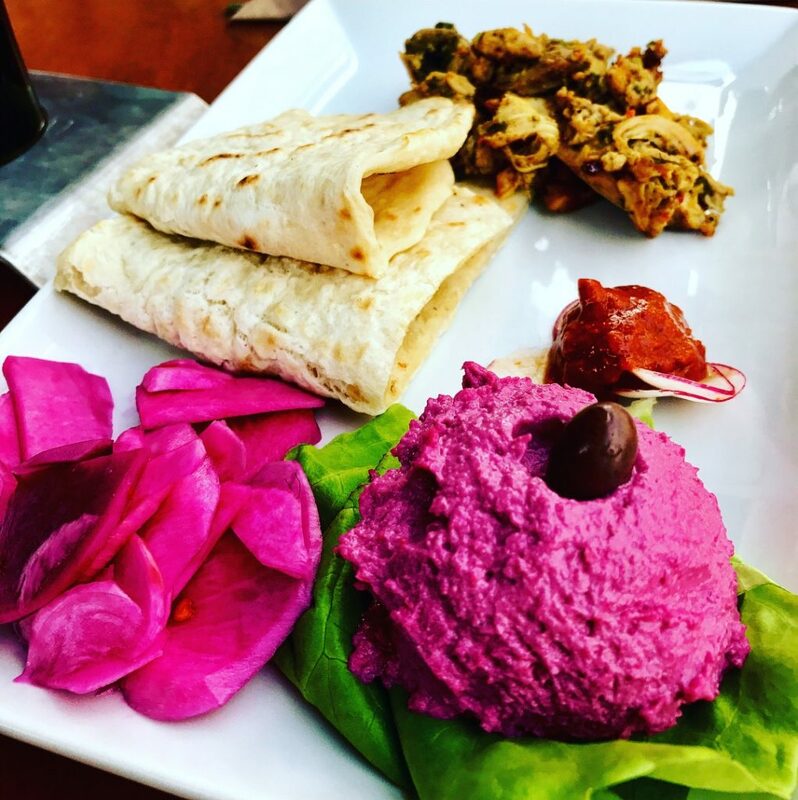 We ordered some vegetarian tacos and a spicy Indian chicken dish with fresh pita and neon pink beet hummus. We enjoyed the food so much that we had to get more, so we ordered their baked Focaccia bread with melted cheese, marinara and a selection of sliced meats. It too was unreal! The food at Cumberland Brewing was spectacular. Everything is made fresh and had a unique flavour twist than what we have come to expect from the average brewery dining experience. While we were sitting there enjoying our meals we were fortunate enough to meet Darren, one of the owners. He joined us for a short while and shared his stories about the opening and growth of the brewery. His energy and enthusiasm for what he does is very evident. I could really hear the passion in his voice as he spoke. This is truly my favourite thing about drinking craft beer. I love supporting our local economies and occasionally walking into a brewery in a small town and meeting the people who actually make the beer and sign the paycheques. Overall, much like our visit to Gladstone, this too was a genuinely fantastic experience. Back to Crown Isle for a soak in the jacuzzi tub to soothe the muscles and to get ready for another night out. We had been told by some of the locals that if I loved craft beer, The White Whale would be a great option, so we ordered up a cab and were on our way. We drank the night away and enjoyed some tasty nachos while chatting with the bar staff and some local regulars. Another great place to check out while you’re in town. 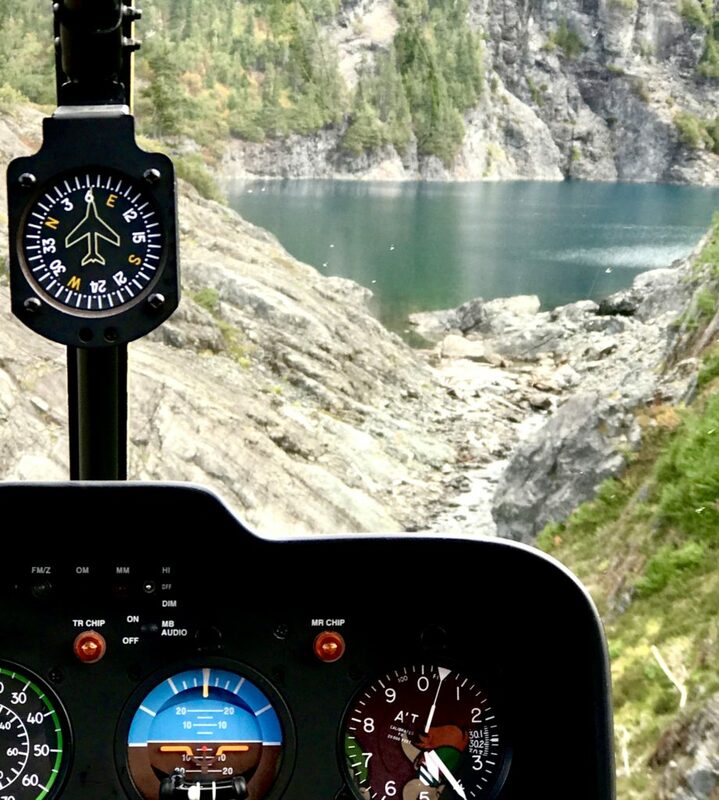 All set to hop aboard 49 North Helicopters for a 45-minute adventure over the Comox Glacier. It may be check-out day but we still had some adventuring to do! 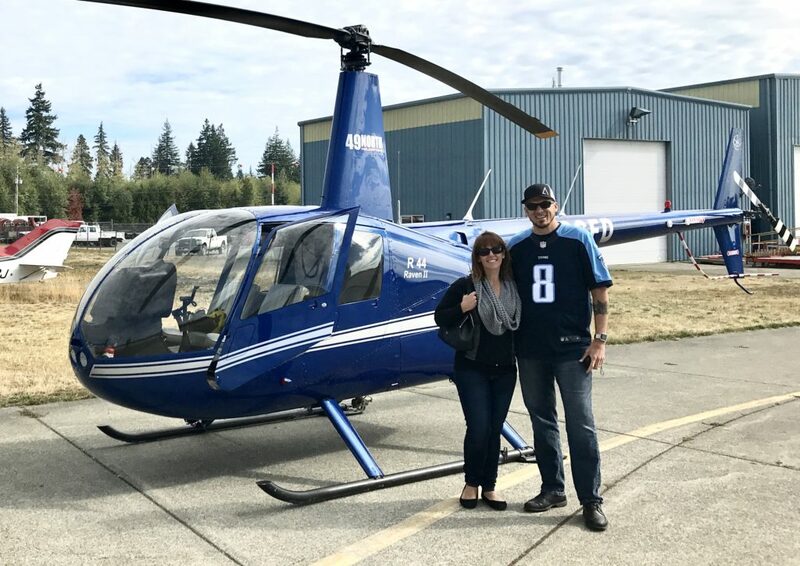 After turning in the room access cards and having some breakfast at the golf course, we tossed our luggage in the Explorer and headed north up the Island Highway to 49 North Helicopters at the Campbell River Airport for a 45-minute tour over the Comox Glacier. Campbell River was about 60 kms away but thanks to the 120km/hr speed limit on the inland Island Highway, we were there in no time flat. We arrived and signed our life away and headed out the door to the awaiting chopper. We were joined by a tourist from Sweden who we let ride shotgun in the four-seater Robinson R44 Helicopter beside our pilot Bastian who was ready to roll. After a quick chat with the tower to warn us of some parachuters in the area, we were off. Flying due west over the runway we were instantly greeted by a landscape clinging to its lush green colours as of summer and the awe of the experience began to sink in. As we got closer to the glacier itself I was at a loss for words at the natural beauty that was below us. The vibrant deep blue water of the glacier lakes that sat silent, filled to the brim, at the top of the various peaks were a sight to behold. Bastian flew the helicopter tight to the mountains and up and over peaks, giving us a close of view while I snapped picture after picture. After circling in and out of the peaks we looped back and flew over top of Lake Helen Mackenzie. It was pretty cool to see the entire hike we had done the day before from above. We ventured over to the peak of Mount Washington and did a couple tight circles to entertain the hikers below and then made our way back the airport. 45 minutes was over in the blink of an eye. It was an exhilarating adventure that must be experienced to appreciate. 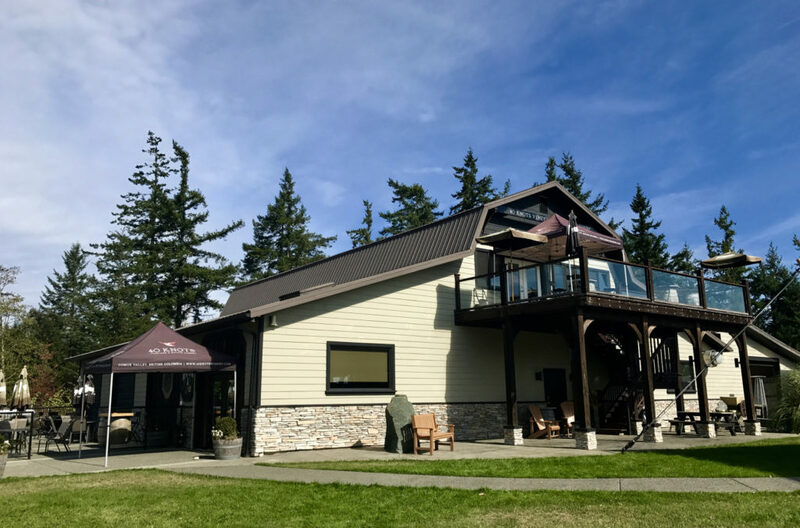 Back on solid ground, we said our goodbyes and headed into downtown Campbell River to visit the local craft brewery, Beach Fire Brewing and Nosh House. 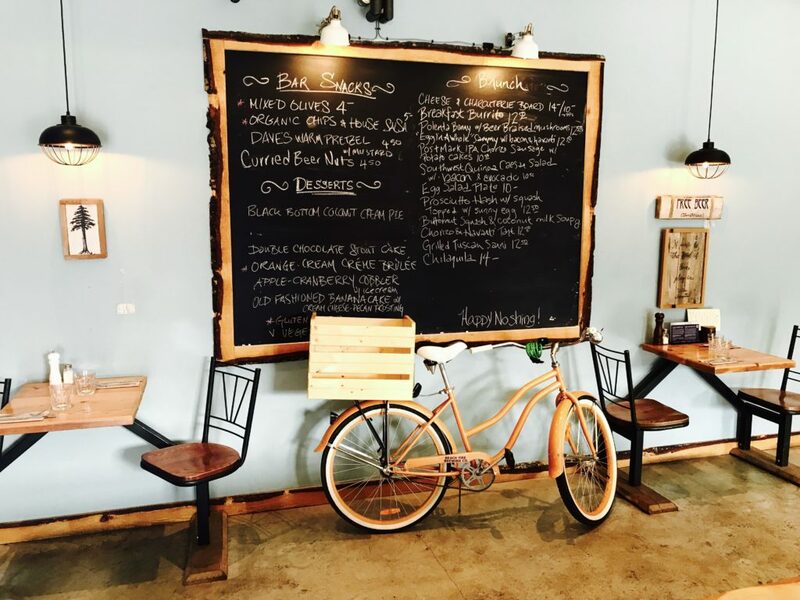 The place has a cool look inside: a rustic bar with stools, long harvest tables, local artwork adorning the walls, and a cozy sitting area, as well as some patio space. A quick stop to finish up our adventures was had at Beach Fire Brewing and Nosh House in Campbell River. I ordered up a flight and we snacked on some tortillas chips and house-made salsa. The Wheel Bender Stout and their Kettle Sour were both noteworthy, but I enjoyed them all. With the clock ticking down on our return flight, it was time to head back to the marina. Beach Fire is also know for their great food. Unfortunately I didn’t have enough time to stick around and order some of those tasty sounding desserts! Maybe next time. As we boarded the seaplane, we were already discussing when we would come back to the Comox Valley. It was truly a fantastic experience visiting the region. 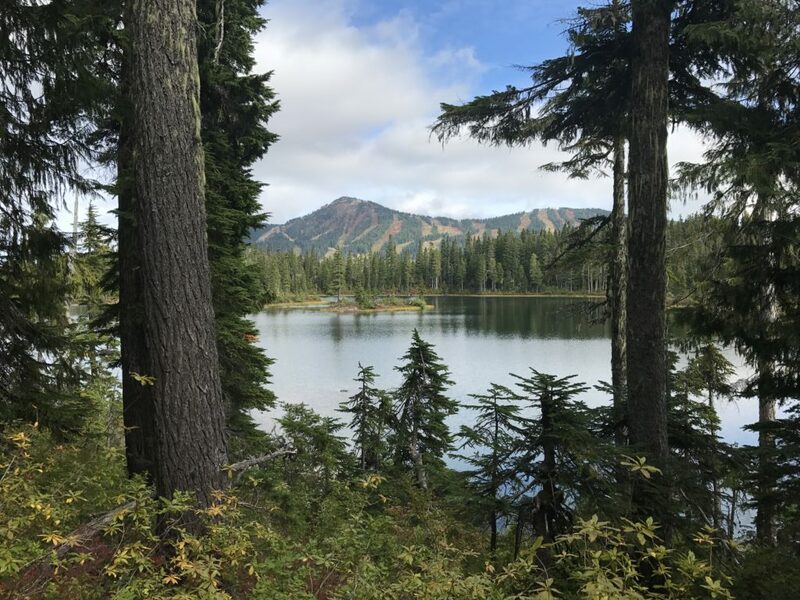 It has everything we look for when we travel: natural beauty, great options for craft beer, adventurous excursions and a list of restaurants making some memorable meals. Can’t wait to return soon and explore a little more!